…And finally, I don’t expect anybody to read this blog post tonight, but I just thought I’d round off the year whilst waiting for Jools Hollands Hootenanny and whilst I’m still reasonably sober – whatever happenned to Andy Stewart? So me and superdawg bagged our last bag of 2008 today – a Wainwright outlier and Birkett and quite nice limestone hillock at Shap called … Knipescar Common. I think that’s a rather fine name for a hill. It also has Knipe Moor, Knipe Hall , Knipe Fold and..er… Shap. 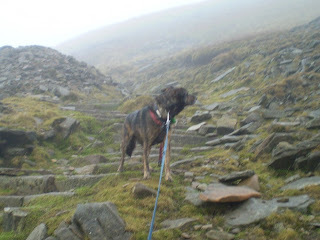 Despite the fog, we found both tops and a nice permissive path not marked on the map, but running parallel to the crag scarp through the Lowther estate. The ground was frozen quite hard and made climbing up or down steep bits a bit of a lottery since my boots couldn’t get any sort of purchase. I expect there’s a rather fab view of the main Lake District fells from the top, too. Anyway that’s it for me for 2008. That was my 127th walk and my 1175th mile this year (last year if you’re reading this next year – or this year if its this year when you’re reading about ..er…last year… or sumfink, innit? I wonder if I can manage 128 walks next year? Santy brought me socks and undies for Christmas – the undies in question being iceberg (or something….) merino wool trollies and long johns, and the sox being sealskins. So, along with the bottles of nice scotch and a sort of bobbly digital camera tripod thingy, I’m well chuffed with this year’s haul. On the way back from the weeding, spoken of in the previous posting, we seem to have become diverted into Aldi’s car park in Halifax – and I came out with yet more merino wool stuff –in this case, a top at a stupidly low price and some snow goggles in case it ever snows again and then sunshines, and a mid-layer top. 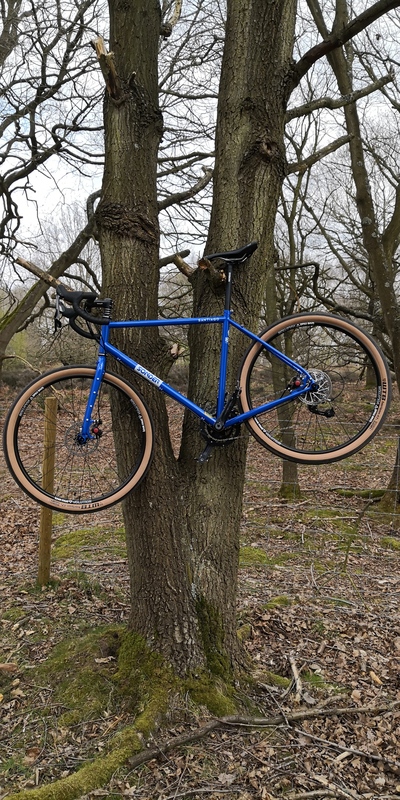 So, me and superdawg decided it would be a bit of a jape to try out some of the kit and we had this little walk to a small but significant patch of trees overlooking Weardale. 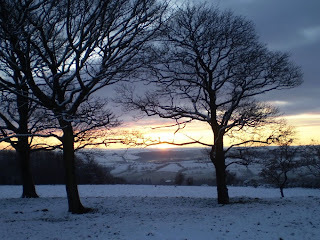 Its quite handy for Knipe Towers as its only six miles from here to Wolsingham and it is one of my favourite little trundles for the winter time – or, very specially for a warm summers evening with some twilight and a big moon at the end. 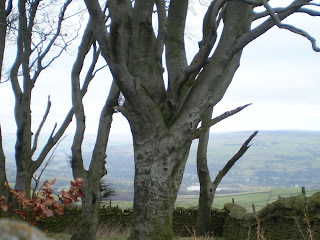 The Elephant Trees are a famous Weardale landmark, or should that be a treemark? Anyway, you won’t find the name on an OS map, cos it’s a local name. 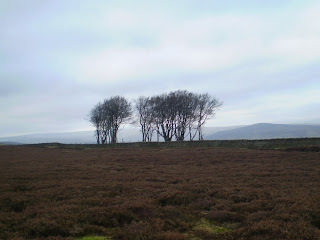 You can see this little patch of trees on the Weardale skyline for absolutely bloody miles and, so it is said, they once looked a bit like a small herd of elephants, specially after spending a long liquid lunchtime in the Black Bull. Weardalers are very fond of the Elephant trees and, as they’re getting quite old and just a bit senile, some replacements have been planted in their little walled enclosure. But it’s a windy spot. They’ll need to be tough trees. Some of the old codger Elephant Trees bear witness in the carved hearts, dates and initials on their wizened bark. Anybody who fells these trees will need to watch their backs for a long long time. 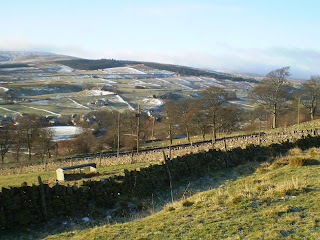 It’s an easy walk, though – up a hill, along the moor, down the hill to Frosterley and back along the riverside and through the townfields of Wolsingham. 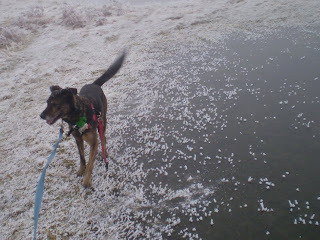 There are usually snowdrifts when I do this – but not today, just a little bit of ice. 10 Miles and about 1000 feet of upness. And the undies? They’re fab, as it happens. 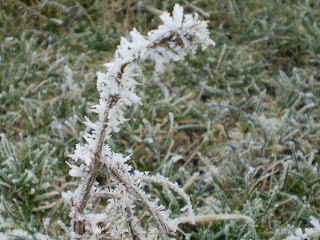 The temperature was around freezing but with a very light wind. I was also wearing some Ronhills, the mid-layer top plus softshell windproof smock. And a smug, warm look. This is us off to a weeding..er.. wedding just now. A small contingent of Knipes and a Carter are just leaving ffor the exoctic climes of Junction 25 on the M1 where I've booked some very cheap beds in a desperate hotel. Tommorrow, we will set up camp 1 at a small Knipe stronghold in Long Eaton for breakkies before pressing on to the even exotikker climes of Wellingborough for the actual conjoining thingy. You ought to be relieved to know that this merging of ancient dynasties is unlikely to be the cause of any major global conflicts or lead to the violent deaths of very many people. So just be grateful for that. As you're probably aware, today was the shortest day - that is the day with the least daylight. Tomorrow, there'll be just a tad more daylight than today and thus it will be until June. This is surely something for walkers and other outdoors types to celebrate, unless you're a creature of the night, in which case it's a right bugger. And so, at stupid-o'clock this morning, with a large crescent moon hanging over the outer suburbs of Crook, I drove off in search of a sunrise. Killhope is such a descriptive name, though dontcha think..... I mean, for such a hopeful day as this. Anyway, it gradually came light, although, this didn't do all that much to improve visibility. Somewhere over Gateshead way, the sun was rising in a coy sort of way, but here it was blowing a right old hoolie, mist hurtling past damply. So I went to Alston to buy another breakfast and then to Brian's at Nenthead for coffee and to talk about the additional hole he's just had made in his bottom. (Its some sort of abcess thingy which needs packing with half a mile of Morecambe Bay seaweed every day. I don't want to know the horrific details, but it sounds deliciously painful and quite the sort of thing you would wish on a wheel clamper or truculent politician. Then I went home for a sleep. 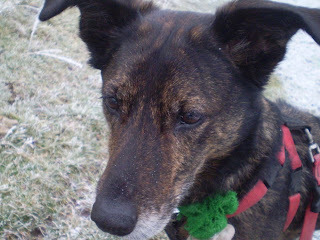 Bruno had punished the household for not being taken on this jaunt by scoffing a pound in weight of Christmas fruit cake; a present from Aunty May. He was apparently saving the big lump of Wensleydale cheese for later. Just now, he's a bit subdued whenever anybody mentions it. I'm monitoring him for signs of ill health, cos dried fruit isn't very good for dogs. He seems Ok, though. 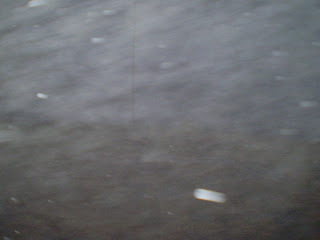 Two of the pics show the driech conditions using two different camera settings. The other shows what Killhope Law summit really looks like. No idea what the big stick is for. 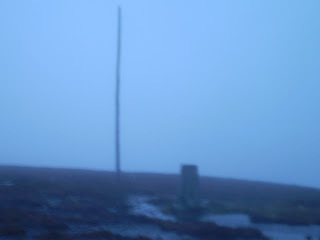 On the map its described as a "mast". But it's a stick. 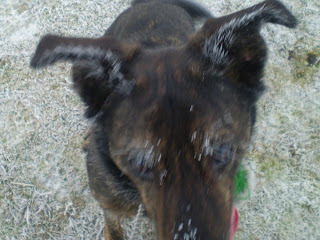 Anyway, so this is Yule. The old father is dead, say boo to the new born sun. This is the start of something better. 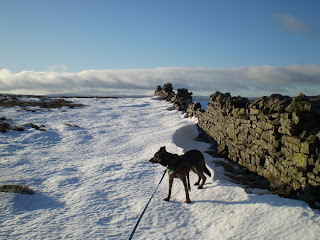 Ingleborough – May absolute fave hill, and Bruno’s too. Actually, he’s no idea where he is most of the time. I met the bro in Ingleton for this little pre Christmas trundle. The plan was to climb Ingleborough, walk along the hill for a bit, descend to the Old Hill Inn and walk back along Twistleton Scars – a very nice bit of karst scenery as it happens. 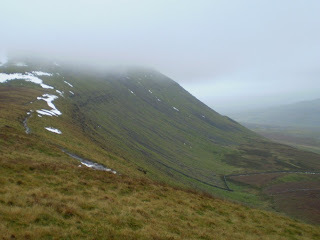 I changed the plan whilst driving South from Hawes – in view of the fact that the hillfog was down and there was no view, and it was tres windy and drizzly and I had a fingernail hanging off. I determined instead to explore the limestone scars along Ingleborough’s Western side and shelter from the gale in a clint. Or maybe a grike. Or a hole. I changed the plan again at Crina bottom in view of the fact that the weather looked a bit brighter and it would be more fun up Ingleborough anyway. And so, a short while later, after some huffing and puffing and the odd kerfuffle and fuss, including Bruno crapping all over Ingleton, which I had to clean up…we found ourselves in the wind-blasted summit cross-shelter on the..er…summit. 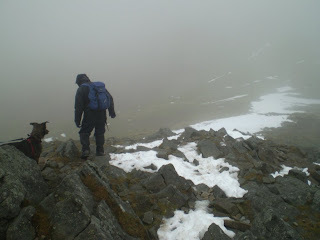 Not a good place for lunch – so we shuffled off down some snow and found a cosy spot behind a wall – scoffed – and then proceeded breezily along the edge of the very fine corrie heading Northwards. 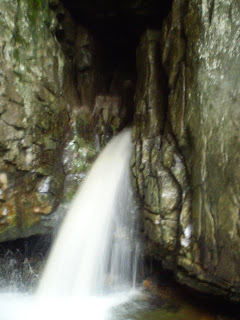 A steep descent and a magnificent leap over a five bar gate by the dawg and we found ourselves in a deep hole or chasm, containing the entrance to Great Douk Cave. 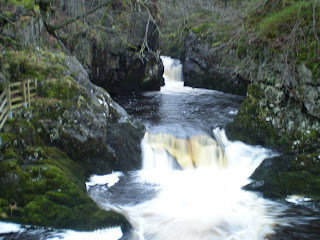 An impressive place, but too much water to explore in hillwalking kit. The pub was open, but it was after 2:00 pm, and we had to negotiate Twistleton Scars, so we forego the pints of shandy (we certainly can live it up) and set off for Twistleton, finally abandoning that idea for a quicker march down the roman road. Incidentally, the chapel at Chapel le dale has the earliest Knipe wedding I’ve found listed in the church register. In 1594 a Mergret Knipe married a chap called Foxcroft. Foxcrofts, Metcalfes and Knipes continued to marry each other around the immediate area and down towards Settle for the next 200 years after which most of them seem to have buggerred off to Pennsylvania. They must have had the reception/booze-up in the Hill Inn…? As at least 33 percent of my followers are now some of my favourite daughters (of the night) and one of their partners anyway, I would just like to point out that following this blog is no way to discover what you're getting for Christmas. The recipient of the rubber egg-laying rubber chicken thingy will have to remain a mystery, as will the magic drinking spectacles and the yellow blobby thing wot I've forgotten what its supposed to be - but probably dangerous for young children, so you at least you know who won't be getting it. The pic attached to this post is completely irrelevant. 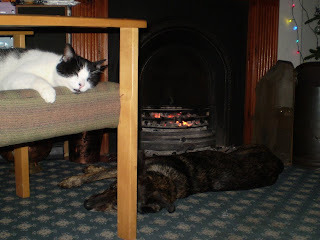 Here’s a picture of Trex the cat relaxing in front of a nice warm Yuletide fire. Ive just joined the Backpackers Club, so I’ll try a couple or three of their meets early in 2009. These are in the Peak, Northamptonshire (no, really…??!) and Arkengarthdale. Then, of course, there’s the TGO Challenge in May, with a practise walk in April around Wanlockhead(ish)… and the TGO English gathering at the Snake Inn. And I thought I’d plan a short winter few days in the Southern Highlands with me ice axe and stuff…. A summer Munroing week in Glen Etive/Grey Corries/Mamores. I thought I’d bag some Birketts, specially Knipescar Common, and, I’ve never been to Pen on the side of Scafell Pike – and some local HuMPs and some Cheviot Deweys, and even more HuMPs and Marilyns in the Borders and Dumfries and Galloway. 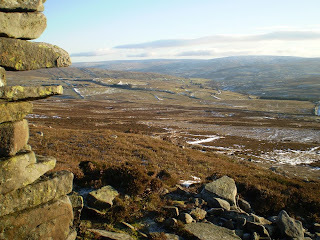 Plus my usual local Weardale/Teesdale/Tynedale/Swaledale things. And whatever else shall arise, probably in the form of various holes in Tynedale with Brian (currently suffering from something that needed lancing, that its not possible for him to view without a mirror – if you catch my drift. Anyway, it’s a very painful hole, apparently, so he’s out of commission for a while). And that’s about it. Each of the first six months seems to have some time away from home. Its going to be fab. 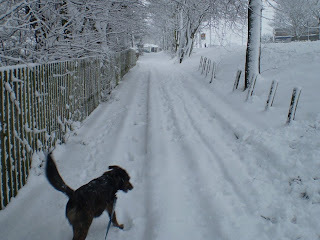 In the meantime, it snowed again last night and today’s dog walk had to be extended to take advantage… Oddly enough, I got a bit lost just after it went dark and ended up with some horses trying to muscle the dogs out of the way…. 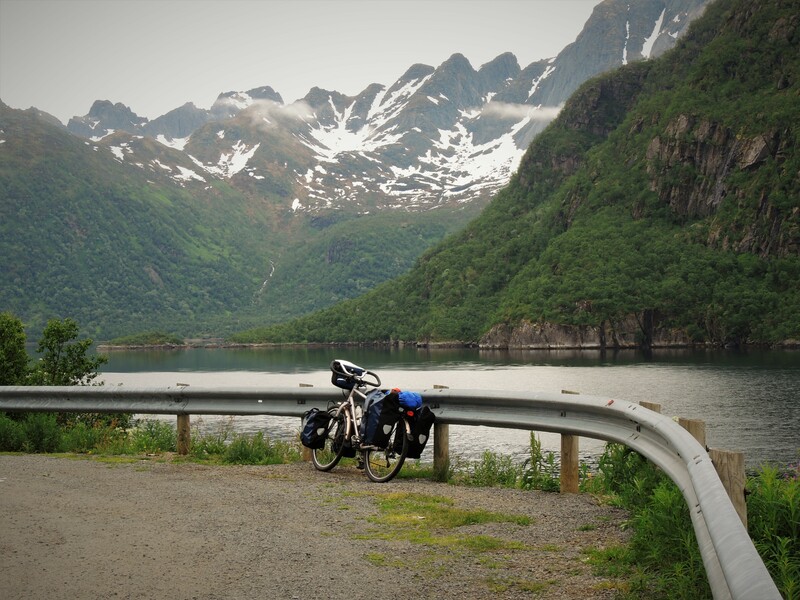 I've just received the vetter's comments on the route I submitted a week or so ago. My vetter this year is John Donohue. This year, aside from pointing out the inadequacies of my gaelic place names "You are to be congratulated for your early posting; congratulated, too for your valiant if hopeless battle with Scottish place names...."
Apart from clarifying where I actually meant for a couple of places (ahem! ), John has pointed out a nice route improvement for me for climbing out of Glen Feshie (I am avoiding trying to remember how to spell the name of the bothy, but it's pronounced apparently without any consonants at all and sounds like somebody found the hot water bottle with their bare bum. I didn't protest to John that I have the same struggle with English place names and Welsh is a mystery. 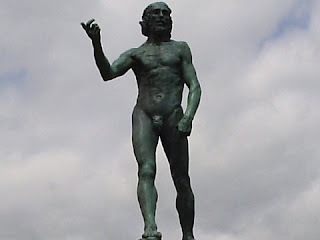 I am aware that many Welsh villages are Pants, though.. So, now, the route planning bit of the ...er....planning is complete. I have to add a couple of days at the start now, and also design a little four day training walk in April next year. When I've done the first part of this - the introductory days, I'll do a food plan. JD, by the way, is one of the funniest blokes on the planet and whenever he's allowed to do a proper after dinner speech at The Challenge Dinner, its a real treat. 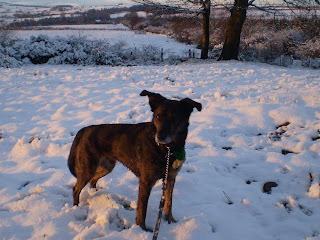 Me and The dawg had a wander up a very icy- and a little bit snowy Weardale today, starting at the auction mart car park at St Johns Chapel. We slithered our way up the hill to the North and along various bridleways to the very top of Middlehope Moor - at just a tad over 2000 feet. There's a complete silence on these hills just now (in between visits from the RAF) - just one bird, I think it was a Plover going "peep" in the ever-so-slightly-bored-with-it-all way that Plovers go "peep". Very rough going on the heathery tussocky bits and attempts to walk on hardened snow failed with knee-deep plunges at the rate of once every ten steps - but in such a random sort of way that it was just too much of a lottery. Deeper drifts on the very top of the moor worked out to be more reliable. 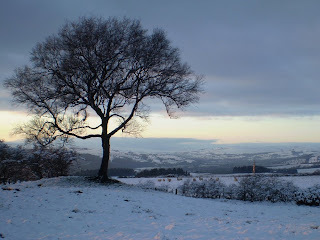 And then we found Puddingthorne Edge Currick. 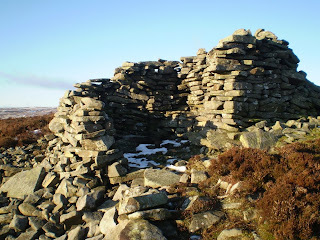 At first, I thought this was just a pile of stones, but on closer examination, I found it had a built-in stone seat and a shelter, facing down the length of Weardale and quite cosy in the sunshine. Bruno dozed off. I ate a mars bar and some flapjack and finished my green tea. Just a yard away, it was a nithering minus two with an epic wind chill, but here it was toasty. Worra grand place to sit away a long summer evening with a bottle of beer - or to watch the summer sunrise, maybe. 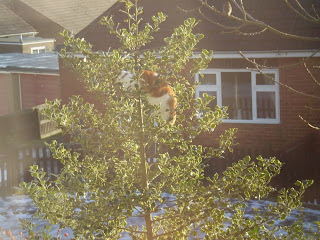 I spotted this chap aloft in a neighbour's holly tree this morning. 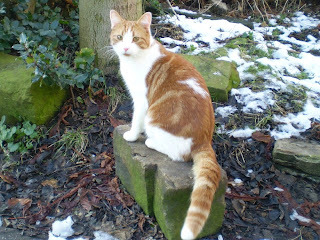 This is Thomas, next door's adolescent cat. He often comes to play, and seems to like me - but here, he has the more serious intent of killing the sparrows that congregate very noisily in my privet hedge - hence he's up high in their tree. There's about thirty sparrows in all and Thomas sees it as his job to reduce the numbers. He's not been very successful yet, but I suspect I'm going to have to change how I feed the birds. Our own tom cat, Trex (cooking fat, gettit?) has recently lost a fang and isn't too bothered about decimating the wild bird population any more. He does get a bit twitched by Thomas's stalking, or is it shadowing...? 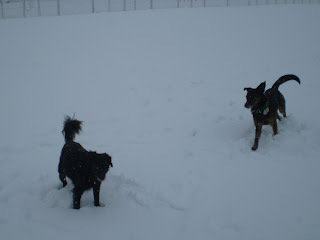 Superdawg sees Thomas as prey. I see my job as making sure that nobody gets hurt. This post is in the key of E with standard blues changes. An ma woman dun left me. The A66 and A68 were closed and a lorry had blocked the A1. 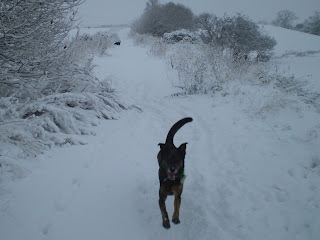 Not weather for driving anywhere, so me and superdawg, and his sidekick, Robin (aka Tammy) went for a walk up the Deerness Valley Walk. The Deerness Valley walk starts (or finishes?) in Crook and goes over the hill to the..er... Deerness valley, which it follows to the outskirts of Durham. 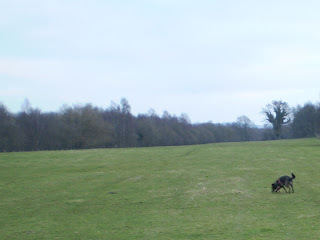 From there other walks go to Lanchester and to Bishop Auckland. 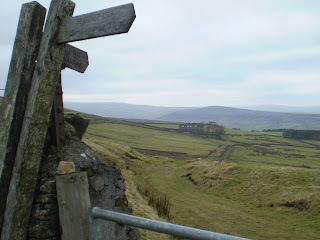 The Lanchester walk links up with the Derwent Valley walk, which can be followed to Gateshead, or if you follow it the other way, it goes to Weardale. These are all old railway lines. The Deerness valley route is heavily wooded due to being planted for pit props which were never used. Its all quite beautiful. 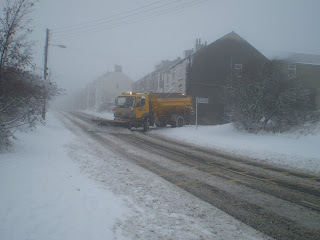 We just got to the top of the hill where it we met the hill fog and a snow plough. Very deep snow which was heavy, wet stuff and quite hard work. Its an ill wind, though - as they say - the local schoolkids were rolling snowballs, sledging and chucking snow at each other instead of being at school. As this is the type of snowfall we used to have when I were a lad, and which we haven't had for a few years now, I consider this to be good education anyway. they'll now be able to say to their kids (when they get some kids) - "When I were a lad, it used to snow up ter t' rooftops...."
I'm starting at Glenelg (after some initial non- challenge wanderings) and heading towards Kinloch Hourn and bagging a little hillock on the way. 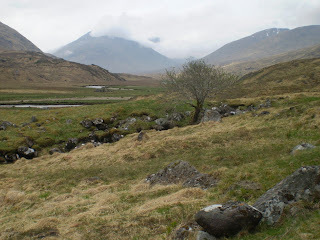 next day, its Westyer Glen Quoich to Allbeithe, then Easter Glen Quoich (I like to have the set) and a small peeeemple and some woods to Tomdoun where I will spend the kids' inheritance. Then to Loch Lundie - followed the next day by a raid on the shops and pubs of Ft Augustus before carrying on to Blackburn Bothy. Then over the moanyminnie hills for two days to Newtonmore, where I will wash my mucky neck - then Phones to Ruighaiteachain, followed by the Cringroms to Derry Lodge. I'll pass fleetingly and boozily through Braemar to Callater, then over Lochnagar to Shielin of Mark. 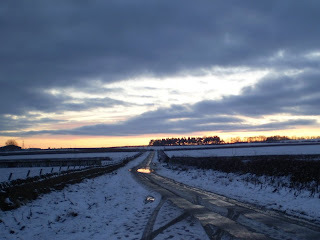 Tarfside follows that, then Fettercairn and lanes and tracks to Johnshaven. Its a lowish level route and I'm going to camp, although i'll probably seek clean sheets and a roof in Newtonmore and Fettercairn. I need to think about Fettercairn a bit more.